We may have devised the best summer intern challenge of all time when we asked our squad of 3 Jibterns to present us with a variety of dancing doodies in preparation for an upcoming card. The result was hilarious and strange smattering of muck! Which dookie design won? You’ll have to wait for the final piece to find out, in the meantime check out the doodles below, but if you don’t like the color brown, don’t scroll down! 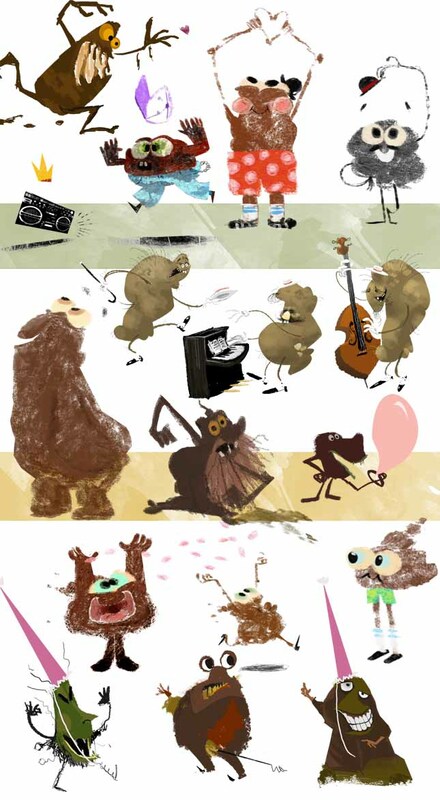 This entry was written by paulhanges and posted on July 30, 2009 at 3:40 pm and filed under Inside JibJab, Production Art, Sneak Peeks with tags dancing doodie. Bookmark the permalink. Follow any comments here with the RSS feed for this post. Trackbacks are closed, but you can post a comment. That is very cool and artistic. Keep up the good work.